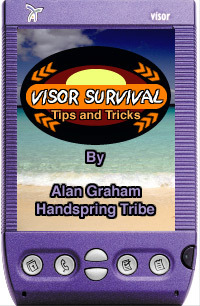 Fri Feb 9, 2001 - 11:22 AM EST - By Alan Graham Table of Contents » Handspring TribeHardwareSoftwareMisc. As a member of the Handspring Tribe, I have spent the past year perfecting my Visor travel experience. There is nothing greater than traveling without the added weight and bulk of a laptop in an airport. I also can't stand the little "please boot it" dance the security guys make you do (I suspect this is less for security and more for laughs over coffee in the break room). If you gotta boot, nothing is easier than the occasional "instant on/off" of my Visor. After running into a number of travel snafu's, I put together a Visor "Survival Pack." With it, along with my Boy Scout training, I have been saved from a number of small crisis (I can make a splint out of two modules and a phone cord). I keep my Visor "Survival Pack" always ready to pack and since it is so handy, I thought I would share some of my tips and tricks. At the end of this article, please join our Travel discussion thread and share your own Visor travel experiences. We'd love to hear them!